Use this thread to discuss episode 01x15, Tuttle. Tuttle is without a doubt my all time favorite episode. I love the way Tuttle became such a loved member of the camp yet he didn't exist. Hawkeye's eulogy is hilarious. He keeps looking over at Radar with a silly look on his face. I can watch this episode over and over and never get tired. 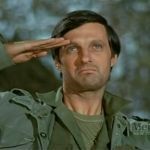 In January 2015, visitors to MASH4077TV.com voted "Tuttle" their favorite episode from Season 1. Do you agree or disagree? As I've said before, "Dear Dad" is my personal favorite comedy episode, but it does have some very strong competition, including this episode. I feel like this is an episode that could only be done during this early period of the show. Not just because of the writing and tone shift that the series took, but because of the characters. As it is, it's already a push on credibility, but it's much easier to believe that people like Henry and Frank can be fooled so easily by the ruse as opposed to Potter and Charles. Though in this case, the unbelievable nature of the story doesn't really hurt the episode at all IMO. If anything, it makes it all the more hilarious, and the lie gets more and more outlandish. It helps that the writing is really on point in this episode, with all the characters' lies about their relationship with Tuttle (Henry and Frank pretending to be close friends with him), Margaret's imagination going wild to the point where she's infatuated with him, etc. And the attempts to preserve the lie are great as well, especially Hawkeye and Trapper coming up with his personnel file, Hawkeye's impersonation of General Clayton, and Hawkeye revealing Tuttle's "death." The entire cast was used brilliantly in this episode.